Sometimes we get very unusual requests to use our collections. 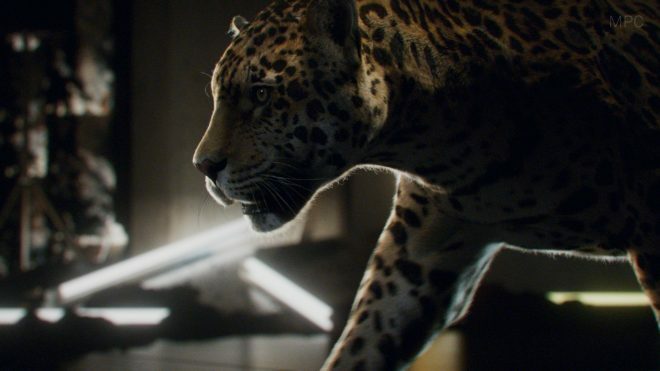 In April 2018 Magda Krimitsou, a producer at the Moving Picture Company in London, emailed me to ask whether we had a jaguar in our freezer, so that her colleagues could examine it in order to develop a photo-real computer-generated (CG) jaguar for a client. Normally we don’t keep animals of that size in our freezer, because there is a risk that the fur will slip (rot) when the animals are being thawed for preservation (and they take up a lot space!). And so we didn’t have a readily available jaguar. We agreed to discuss ideas in a conference call with Magda and her colleagues a few days later. I suggested that we had skins and skeletons which they would be welcome to examine in detail, and that there are published references showing the muscular anatomy of big cats, such as lions and tigers, which they could use. No sooner had I put the phone down, when it rang almost immediately. 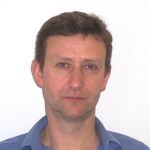 It was Giles Clark from the Wildlife Heritage Foundation’s Big Cat Sanctuary near Ashford in Kent. Sadly, Giles was planning to euthanase an old male Sumatran tiger, who was suffering from kidney disease and other ailments from which it could not recover, and its quality of life was deteriorating. We accept many animals from zoos that have reached the ends of their natural lives. These provide important opportunities for preserving skins and skeletons for our research collections, but also for research into the soft anatomy of animals and providing tissue samples for extracting DNA. So, here was an unexpected opportunity to examine a big cat’s muscles, which would be broadly similar to those of a jaguar’s. Apart from differences in limb proportions, all big cats are essentially the same once their skins are removed. I emailed Magda and asked if she and her colleagues were interested in examining the tiger and she did not take long to agree. In early May the tiger arrived at the National Museums Collections Centre, as did Magda’s colleague Fabian Frank, who would be creating the CG jaguar. 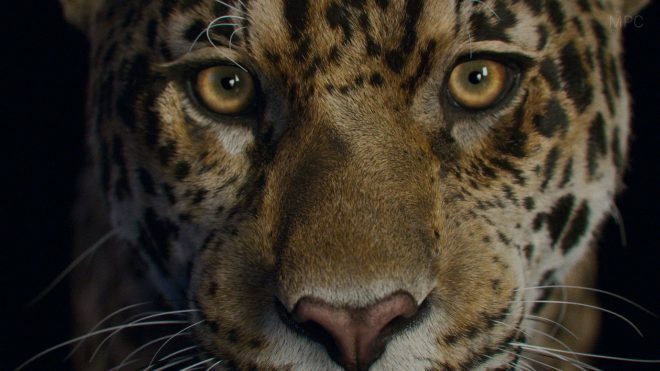 Fabian took many hundreds of photographs; firstly of the fur of the tiger to see how it lies along different parts of the body, along with details of the whiskers, muzzle, nose, eyelids, paws and any other part that would be seen in the animation. Leaving Georg to skin the tiger, so that we could preserve it, Fabian and I investigated the preserved jaguar specimens in the research collections. Flat skins are easy to access and photograph and, close up, show remarkable details that would not be easily visible in live animals or on film or in photographs of jaguars. 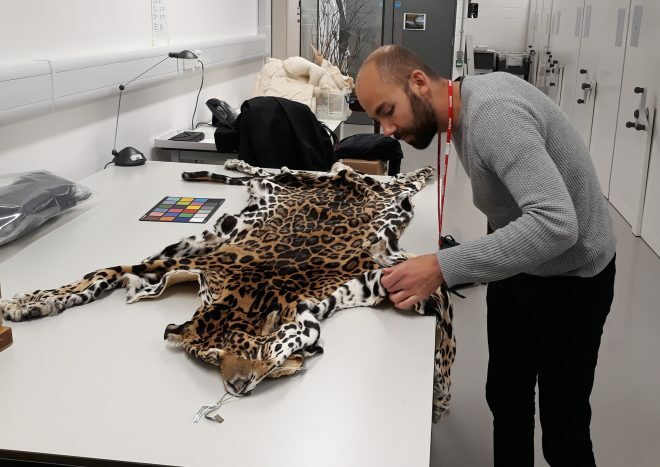 Examining a preserved jaguar flat skin from our research collections. After the skins, came the skeletons. Boxes of bones were lined up on the bench and I explained to Fabian what the different bones are and showed how they articulated with each other. We roughly reconstructed a skeleton so that Fabian could record the limb proportions with his camera and understand how much movement occurs at each joint. After many more photographs and sketches, we returned to the skinned tiger. Once again Fabian got to work with his camera. Georg and I manipulated the tiger’s legs and backbone to show how they move in life, which Fabian recorded meticulously. Finally Fabian was finished and ready to return to London. 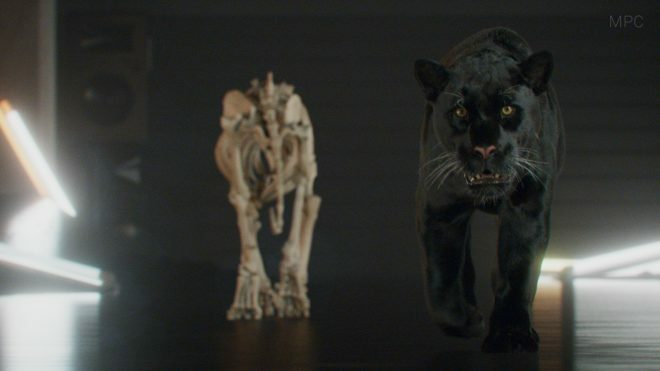 He warned me that it would be about six months before the CG jaguar would be seen. The completed CG jaguar. Images copyright: Moving Picture Company. This is unbelievable work, I could watch an hour long program dedicated to making solely this. The final result is stunning.